Good Morning & Happy Saturday Stamping Friends! I have numerous projects that I work on & I thought it would be fun to share some of them with you so I'm starting what I'm going to call Saturday Shares. You may not see a post every single Saturday but I think you will enjoy what I have to show you. Some will be swaps like the one posted today & others will be just some fun things that I'm doing. ENJOY!!!!! Thanks so much for stopping by! See you again on Monday with my post for ABC Challenges. Have a great rest of the weekend!! What a gorgeous stamp. I have tons of Stampin Up stamps. I need to get them out and use them again. Your colors are fabulous and I live your take on the sketch. Thanks for sharing your card with us. Thanks for playing our color challenge at 4 Crafty Chicks! Such a pretty card, Love the TT paper is make the image pop. You used on of my favorite ribbons! Happy to have you us at SSW. Absolutely lovely Jackie, love the colors and great design! Very pretty card, Jackie! The papers, stamp and design are all lovely! Thanks for joining us at Southern Girls Challenge! This card is gorgeous - love the image and the ribbon and bow are beautiful!! So glad you joined us this week at Sweet Sketch Wednesday!! This is so pretty Jackie. I love the colors and the design. Wow Jackie, such a stunning card with fabulous detail. Thank you so much for sharing your project with us this week at PCJ Challenge. I like this simple design. I like your embossing, too. I always forget to emboss! Hi Jackie, what a stunning card! 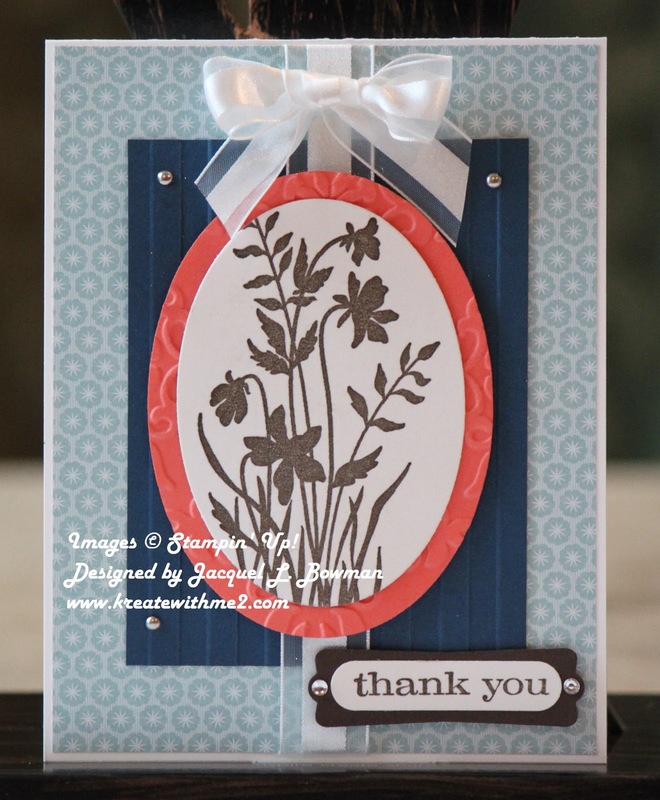 I love the stamp, and the bow softens the formal layout perfectly...so pretty! Love those colors together. Your card is clean and beautiful. Thanks for joining in the fun over at Sweet Sketch Wednesday. Jackie, this is a beautiful Thank You card. Love it! Love your cards Jackie! You've got such great pops of color in all of your work. Thanks for visiting my blog, leaving the sweet comments that you did about my work. I'm just starting out so I may just have to pick your brain from time to time! LOL. I have also become a follower of yours! Beautiful thank you card. Great texture too! Wahooo! I love the pattern paper and the textured paper. It really makes your image pop. Wonderful layout too. You make these colors look so easy. This is a gorgeous card and I love the bright pop of tangerine that draws your eye to this wonderful stamped image. I have this stamp and so glad you've inspired me to use it again. Beautifully done with the sketch too. So glad to have you join us at Sweet Sketch Wednesday! This is just gorgeous and the ribbon finishes it off perfectly. Thanks for sharing your talent with us. Good luck. Beautiful card! I love the colors and the oval framed image is so pretty! I haven't played with Just Believe in a little while, time to bring it back out! Very beautiful c&s card! thanks for playing with SGC this week and good luck!